Mysteries of History: The Origins of Uncle Sam ~ The History Girl! As the old saying goes, there are two sides to every story, but in this case, there are “two parts” to the story. During every 4th of July parade, you can rest assured that Uncle Sam will make an appearance and as he walks along the boulevard waving, he sometimes throws candy to the crowd. We have all seen the old recruiting poster from World Wars I and II, with an older gentleman wearing a blue tuxedo suit coat, a white cotton shirt, and the famous white top hat, with its ring of stars around the crown. Have you ever wondered how this iconic figure came to be the symbol known the world over that represents the United States? The first known use of the combination of words "Uncle Sam" came from an actual man named Samuel Wilson of Massachusetts (b. 1766, d. 1854). He served in the Revolutionary War as a drummer-boy and later as a soldier. After his service, he moved to Troy, New York, where he created a business as a meat-packer. As a business owner, he displayed a friendly and fair business atmosphere, known around town, by children and adults alike, as “Uncle Sam”. During the War of 1812, Sam provided pork and beef products to the U.S. Army, who was camped on the outskirts of Troy. He shipped these provisions in barrels marked, E.A – US, for the Army and was never sold at retail. However, the abbreviations U.S. were not being used during that time. When a Federal inspection team visited Sam’s plant, on October 1, 1812, they asked an employee what did, “E.A – US” signify. Unsure of what to say, the employee remembered what the kids called his employer, and then replied with a laugh, “Why that’s Elbert Anderson, the contractor, and Uncle Sam." By the 1830s, Brother Jonathan, a political cartoon that represented the country itself, made a reference to Uncle Sam, implying that they symbolized different things: Uncle Sam represented the government and its power. Although similar in appearance, their meanings differed. By the 1850s, the name Brother Jonathan and Uncle Sam were being used interchangeably and the images of what had been called "Brother Jonathan" were now being called "Uncle Sam." In one depiction of Uncle Sam in 1860, the artist drew him to look a lot like Benjamin Franklin, the image of a portly man, in a black top hat and tails; this image, depicted in Harper's Weekly magazine, on June 3, 1865, as a political cartoon. The image of Brother Jonathan in the January 11, 1862 issue of Harper's Weekly looks more like the modern version of Uncle Sam, sans the goatee that he sports today. Thomas Nast and other nineteenth century political cartoonists modeled him after Abraham Lincoln. 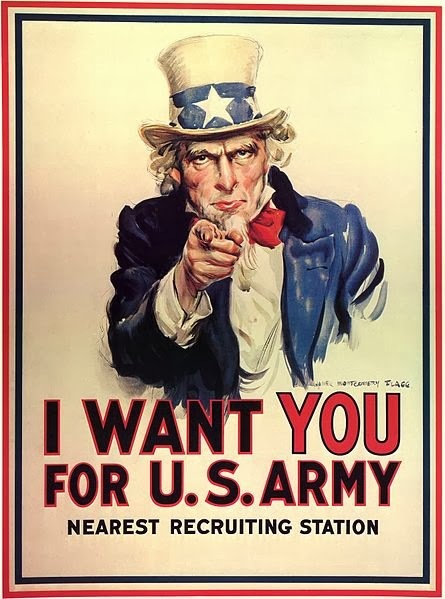 Uncle Sam became standardized in his appearance when James M. Flagg created the well-known “recruitment” image of him. This image, more than any other, sets the appearance of our beloved Uncle Sam as the elderly man with white hair and goatee, wearing a white top hat with a band of white stars with a blue background, and red and white striped trousers; which was a self-portrait of Flagg. This made it inevitable that caricatures of Uncle Sam - like those of "John Bull," already used in England, which would appear in newspapers. The first image of Uncle Sam, shown to America was a print by Flagg for the cover of the July 6, 1916 issue of Leslie’s Weekly magazine. This held the caption, “What Are You Doing for Preparedness?" More than four million copies of this image printed between 1917 and 1918. While Columbia, one of the first symbols of the United States, had appeared with Brother Jonathan and Uncle Sam, her symbolism fell out of favor with the American public as they were now enamored with Lady Liberty. Columbia became the mascot of Columbia Pictures during the 1920s. James M. Flagg's image was used extensively during World War II, and the United States was code-named "Samland" by German intelligence. The term was used in the song The Yankee Doodle Boy, and in 1942 it was also featured in the musical "Yankee Doodle Dandy," starring James Cagney. 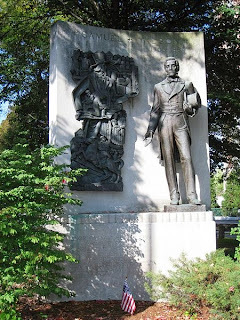 There are two memorials to Uncle Sam, both of which commemorate the life of Samuel Wilson: the Uncle Sam Memorial Statue in Arlington, Massachusetts, his birthplace; and a memorial near his long-term residence in Riverfront Park, in Troy, New York. Arlington, MA Memorial for Samuel Wilson. Next time you see a picture of Uncle Sam, you can reflect upon his origins, allowing you to feel safe and comfortable. The older man who is wearing the famous suit, a white cotton shirt, a blue tailed coat, the red and white striped trousers, the white top hat with its ring of stars, and the trimmed goatee, is truly America’s uncle and will never let anything come between his family and the evils of the world.